A new exhibition at Emory Libraries sheds light on Robert W. Woodruff, not just as the visionary behind The Coca-Cola Company, but also as an important leader and philanthropist in Atlanta and at Emory. “The Future Belongs to the Discontented: The Life & Legacy of Robert W. Woodruff,” presented by The Coca-Cola Company, runs from Oct. 14 through March 25, 2011 in the Schatten Gallery on Level 3 of the Robert W. Woodruff Library on the Emory University campus. Mr. Woodruff was an essential part of Emory’s development into a world-class institution, but he was also instrumental in the making of modern Atlanta – turning Coca-Cola into a global business, establishing a home base for eradicating disease, financially supporting the arts scene,” says Rick Luce, vice provost and director of the Emory Libraries. Curator Randy Gue, a project archivist with Emory’s Manuscript, Archives, and Rare Book Library (MARBL) who spent two and half years processing Woodruff’s papers, will discuss the exhibition and the iconic images of Woodruff during a Curator Talk at 6 p.m. on Thursday, Oct. 21 in the Schatten and Corridor galleries. A professional photo of Woodruff taken in 1909. Woodruff was so proud to be a working man, he dressed in his work clothes for the photo instead of his Sunday best. Woodruff entered Emory College in 1908 but was an indifferent student and was dismissed after one quarter. He felt working was more important than education, so he got a job shoveling sand for 60 cents a day. Woodruff’s home movies spanning the 1920s-1960s, which will be shown on monitors in the Schatten Gallery. The films show Woodruff in Atlanta and around his South Georgia plantation, hunting and enjoying the company of his family, friends and associates. Some of the movies contain rare footage of downtown Atlanta in the 1920s, including shots of the Terminal train station, Peachtree Street and the Rhodes-Haverty Building. “There are very few motion pictures of Atlanta from this time period, so it is a real treat to see the city as Woodruff saw it,” Gue says. 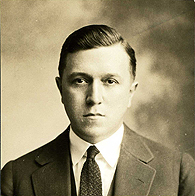 Woodruff’s childhood and early working years, prior to his joining The Coca-Cola Company in 1923. His visionary leadership of The Coca-Cola Company from the soda-fountain market into the bottling and grocery/home markets, and the push for exporting into the global market. His influence on Atlanta and Emory, particularly the gift of $105 million (the equivalent of nearly $316 million today) to Emory in 1979 through his parents’ assets, known as the Emily and Ernest Woodruff Fund. It was the largest single gift given to an educational institution in U.S. history. Ichauway Plantation, Woodruff’s South Georgia home where he spent time with friends hunting and relaxing. It’s also where he set up the first field station to fight malaria, which was rampant in the area, after seeing one of his employees suffering from the disease. Nell Hodgson Woodruff, his wife, for whom Emory’s school of nursing was named. The exhibition is free and open to the public during regular library hours, generally 9 a.m. to 8 p.m. Monday through Saturday and noon to 9 p.m. Sunday. Check the visitor hours for exceptions. For more information, call 404.727.6887, e-mail or visit the MARBL website.